A garbage disposer is essential for any modern American household. Regardless if you live in an apartment or a large house, a disposal unit will greatly reduce the amount of time it takes to clean up after meals. But how do you know what the best food waste disposer for your home is? We have rounded up the top continuous feed and batch feed units of the year, based on power, performance, design, safety, and ease of installation. Find the best model for your disposal needs below! If you want to browse through the best food waste disposer options we’ve found without going into detail, here are their specifications in a nutshell. We have provided the dimension, weight, horsepower, and RPM for every model in the table below. After that, you can find the in-depth review for each unit in the order presented here. One of the major issues with garbage disposals is noise. Even if it’s one of the best food waste disposer models, you’ll still probably struggle with a loud and annoying unit. That’s where the Waste King A1SPC Knight comes in and rids consumers of frustration. We’ve previously praised the Waste King brand in our guide for the best garbage disposal, particularly for the terrific value they provide with their models. As for the A1SPC Knight, you can currently get it for about $160 on Amazon. 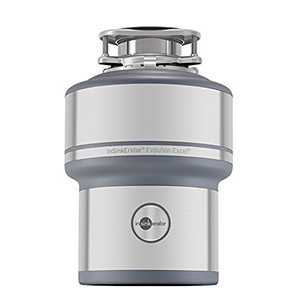 For a food waste disposer, the A1SPC Knight has quite a sleek design. Be that as it may, the housing is actually made of silver plastic, and not stainless steel, as some would expect. Also, the unit is rather on the big and bulky side, with 8.8” x 8.8” x 15” measurements. Still, the Snap and Lock mount makes installation a piece of cake, allowing you to save money that you would have spent on professional services. According to the manufacturers, the A1SPC Knight fits all 3-bolt mount systems. What really makes the A1SPC Knight stand out from competitors is the Exclusive Silencer Technology. In other words, the model is reported to be considerably quieter than the majority of other units in its class. We believe it’s a notable advantage, especially for families with pets, children or elders that could be startled by grinding noise. The 2700 RPM, 1.0 HP motor is excellent, and so is the user-friendly One-pass technology Waste King has incorporated into the design. 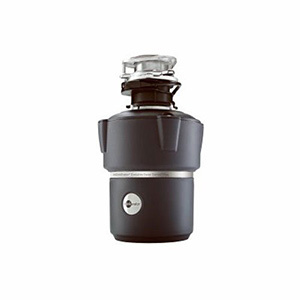 Purchase the Waste King A1SPC Knight if you want the best food waste disposer that performs quietly. It won’t be silent, but at least you’ll feel a genuine difference compared to most other models. If you have a relatively small home or you don’t use your garbage disposal that often, you shouldn’t overspend on great horsepower. In most situations, a 1/3 HP unit should get the job done. However, if you do decide on a 1/3 HP model, we recommend buying yours from a trusted brand. The InSinkErator Badger 1, for example, checks off requirements like company reputation, performance, and long product life, all for less than $100. At the moment, the model is around $88 on Amazon. There are ups and downs when it comes to the design of the Badger 1. While the model isn’t too large nor too small, it has several design flaws that might be irritating. For instance, you can’t remove the rubber gasket for cleaning. Additionally, the overall sketchy design may result in leaks or rust. For all that, InSinkErator units – the Badger 1 included – are reported to last for years on end. Some customers even claim that their units lasted for 10, 15 or even 25 years. 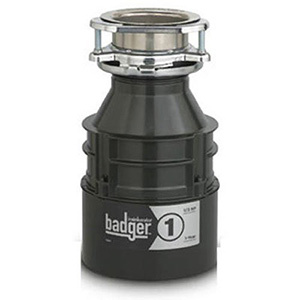 If you’re considering the Badger 1 as a replacement disposer, you won’t be disappointed. The unit is very simple to install, especially when replacing a model from the same brand. Moreover, the Badger 1 is complimented as being quieter than its predecessors. The 1/3 HP motor may not work for large houses, but it will suffice for apartments or smaller homes. We only wish that the model came with a power cord, but the lack of one included is a recurring problem for numerous food waste disposers. 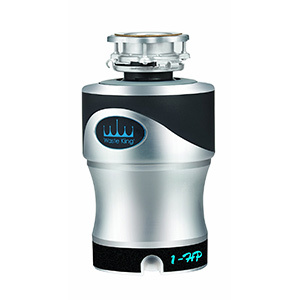 We encourage you to get the InSinkErator Badger 1 if you’re aiming for the best food waste disposer with a 1/3 HP motor. You can rely on it as a fantastic replacement unit that won’t give you migraines during the installation process. 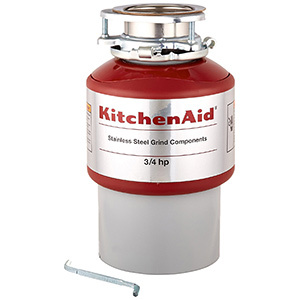 KitchenAid garbage disposal units are quite popular on the market. The manufacturing company is a trusted one among customers, and the units are reported to be long-lasting. If we were to recommend one mode in particular, especially for ¾ HP units, it would be the KitchenAid KCDI075B. Even though its approximately $225 price tag makes it one of the more expensive models, it has a high 4.4-star average rating and you also get free shipping when you order it on Amazon. From a design perspective, the KCDI075B has everything you could want from a food waste disposer. Despite its compact construction, the model features a generous chamber with a 50 oz. capacity. In addition, the grind elements in the KCDI075B are all stainless steel. According to consumer reports, the unit is simple to put together, whether you’re using it as a replacement or a new disposer. Be careful to check your package upon arrival, as there are some reports of missing parts. The KitchenAid KCDI075B is said to be a beast among garbage disposals. It can withstand a considerable amount of food scraps, all while running smoothly. You may have some troubles with leaks, but they’re easily repairable. Some users also mentioned that the unit is on the loud side, but we all know that it’s a common aspect of food waste disposers. All in all, the ¾ HP motor is quite powerful, exceeding the expectations of many. Get the KitchenAid KCDI075B if you want the best food waste disposer that runs on a ¾ HP motor and you’re willing to spend a bit more on a respected brand. The motor will perform as desired, and you’ll be benefitting from a quality unit for years to come. If you want the ideal balance of power, convenience, and value, you should go for a ½ HP unit. Our choice for the best food waste disposer with a ½ HP motor also doubles as the top compact and lightweight garbage disposal. We’re talking about the Moen GXP50C a continuous feed unit highly celebrated among customers. Not only does it have a fast motor and slim design, but it’s also very affordable. If you order yours on Amazon, you’re likely to pay just about $85 for it. The GXP50C measures 5.4 x 5.4 x 13.4 inches, making it one of the most compact models you can get. It’s actually the lightest unit on our list, with a weight of just 7.75 pounds. Consequently, it’s probably the best food waste disposer you can invest in if you have limited space under your sink. However, accessories like the drain plug or splashguard are reported to be rather flimsy, especially when compared to other models. Still, you’ll be able to install and use the unit without much effort. Thanks to the 2600 RPM specs, you’ll benefit from speedy spinning with the GXP50C. The model features a reliable ½ HP vortex motor, which cleverly uses a permanent magnet system. Nevertheless, the main problem with the GXP50C seems to be the noise. Multiple customers complain about a low and loud growl whenever they turn it on. Still, if noise isn’t a deal-breaker for you, the GXP50C is indeed an all-around best buy. 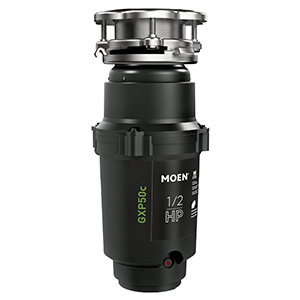 Order the Moen GXP50C if you want a small yet powerful food waste disposer that runs on a ½ HP motor. You’ll get the added benefit of a slim profile, leaving more room for storage under your sink. Whether you have a larger home or you need to grind food scraps daily, you’re best off with a garbage disposal that has a 1.0 HP, continuous feed motor. Out of all the options available, we warmly recommend the best-selling InSinkErator Evolution Excel 1.0 HP household garbage disposer. At around $350, the model is indeed one of the most expensive on the market. Nonetheless, it’s the top-rated unit in its class, with a 4.6-star average rating from more than a thousand customers. At +25 pounds, the Evolution Excel is the heaviest model on our list, but it’s a must for homeowners who need a workhorse of a disposer. Both the grinding components and the chamber are stainless steel, while the latter has a convenient capacity of 40 ounces. The model features multi-grind technology, with three separate stages of grinding to effectively crush food waste. Even though it only spins at 1725 RPM, the 1.0 HP motor is extremely powerful. The unit may be pricey, but it has multiple features that you’ll appreciate throughout the years. Firstly, the SoundSeal technology makes the Evolution Excel incredibly quiet. Secondly, the Auto-Reverse feature works every time you run the disposer. Combined with the Jam-Sensor circuit, you can say goodbye to any potential jams or clogs. We’re only disappointed that, at this price, the unit does not come with a power cord included. Buy the InSinkErator Evolution Excel if you have a larger budget and you want the best food waste disposer with a strong motor. Although it’s a considerable investment, you won’t end up struggling with noise, clogging or jamming. A lot of garbage disposals can be tricky to install on your own. On the other hand, the thought of paying for professional installation as much as you did for your unit isn’t appealing either. In this case, you should find the best food waste disposer with a simple mounting process. One of the top models from this point of view is the Whirlaway 291, a continuous feed unit with a ½ HP motor. Despite its list price of about $122 on Amazon, you can frequently catch huge discounts. In terms of installation, you can’t get any better than the Whirlaway 291. The process is far easier than any 3-screw units, as you only need a screwdriver for setting it up. You don’t even require plumber’s putty if you have a stainless steel sink at home. Please note that you need to purchase a power cord separately if you don’t have one already. Other than that, the 291 has a compact design perfect for spaces of all sizes. Even though the painless installation is the model’s strong point, that doesn’t mean you don’t get extra benefits. As opposed to competing models, the affordable Whirlaway 291 is decently quiet. Furthermore, grinding runs smoothly from beginning to end. Unfortunately, however, there are multiple complaints regarding the product life of the 291. It is reported to rust fairly quickly, so you might want to keep an eye out for any early signs. We encourage you to buy the Whirlaway 291 if you don’t want to resort to paying for a professional plumber to install your garbage disposal. As long as you buy a power cord and you have a screwdriver handy, you shouldn’t have any issues mounting the unit yourself. When you shop for the best food waste disposer, you’ll certainly want a unit that will work as long as possible. With this aspect in mind, many consumers end up buying high-priced models assuming they would last in time. Nevertheless, there are units well under $100 that will last more than a decade. The best example is the Waste King L-1001 – a long-lasting model that you don’t have to pay a small fortune for. At the moment, the best-selling L-1001 only costs around $65 on Amazon. In spite of its low price, the L-1001 has numerous design perks. It runs on a ½ HP, 2600 RPM, permanent magnet motor, which will help you save energy and money in the long run. Additionally, the swivel impellers and sink drain flange are both made from stainless steel, thus reducing the risk of rusting. 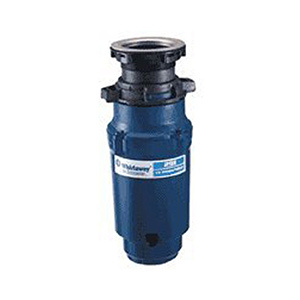 The drain housing and grind chamber are made from glass-filled nylon, further preventing corrosion. Even more, the reset button is mounted in the front for extra convenience. With most Waste King models, you can expect a long and satisfying product life, complete with stellar performance. Customers are thrilled that their sink doesn’t vibrate while the disposal is running. One important problem with the model, however, is that there is no key for unjamming the unit. As a result, you have to call a plumber if your disposer jams. Some users also complained that the disposal causes slow drainage even when you’re not grinding food scraps. 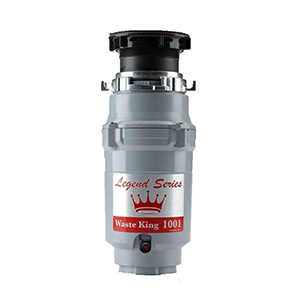 You can count on the Waste King L-1001 if you require the best food waste disposer on a budget. You’ll be paying far less than most competing models, all while getting the same performance and advantages of a pricier disposal. As you have noticed, the majority of garbage disposals on the market are continuous feed. In other words, they use the wall switch mechanism for powering the unit on and off. Nevertheless, this method can be dangerous if the user isn’t attentive. If you want full safety while disposing of food waste, you should definitely consider a batch feed unit like the InSinkErator Cover Control Plus. It’s won’t be cheap (around $270 on Amazon), but at least it won’t result in any tragic accidents. It’s all about quality when it comes to the Cover Control Plus. All grind components are made from stainless steel, as well as the grind chamber. The model uses a magnetic CoverStart system, meaning that the unit starts running only when completely covered by its lid. One of the downsides connected to the Cover Control Plus is that it’s big­. Before ordering one, make sure that you have enough space under your sink to fit the 10 x 10 x 16.2-inch unit. In addition to the safe functioning, the Cover Control Plus has a series of other performance-related advantages. Owing to the batch feed system that requires covering the drain, the model is incredibly quiet, not to mention that it doesn’t jam. The drain is also larger than with continuous feed units, meaning that you can fit in more scraps at a time. The process becomes inconvenient only if you have larger amounts of waste to grind, as it will take longer than with continuous feed models. If safety is your #1 priority, you should invest in the InSinkErator Cover Control Plus disposal. We view it as the best food waste disposer that uses batch feed technology, owing to its praise-worthy performance, high-quality construction, and quiet operation. To be honest, it’s ridiculous to see how many garbage disposals don’t come with power cords. Luckily enough, there are a select few that do come with power cords pre-installed. If you don’t want to endure the extra money and hassle of purchasing one separately, you should invest in a unit like the GE GFC525V. The ½ HP continuous feed model has an Amazon list price of around $110, but you may be lucky enough to get it on sale for less than $100. Ladies and gents, we have yet another major space-saver on our hands. With 5.2” x 5.2” x 12.8” product dimensions, the GFC525V was designed to fit snuggly under any kitchen sink, no matter how limited the area is. Of course, the greatest design benefit is that the unit comes with the power cord attached. Combine that with the super-easy EZ Mount installation and you’ll have your disposal up and running in less than half an hour, even if it’s your first time setting one up. A motor that runs at more than 2800 RPM is fast. To put it otherwise, you can expect the GFC525V to quickly and effectively grind food waste. Although this newer model is indeed quieter than its predecessor, it’s still reported to be very loud, even for a garbage disposal. Still, keep in mind that you’ll only be running your disposer for a few seconds at a time. There are several complaints of short product life and fast rusting that you should consider, however. We suggest you buy the GE GFC525V if you want the best food waste disposer that comes with a power cord attached. The model has a slim profile, performs adequately, and can be installed without much effort even by a novice. It’s clear that Waste King is an industry-leading manufacturer of garbage disposals. The trusted company has the best-selling models on the market, with some of the highest consumer ratings. Therefore, it’s no surprise that the brand secured the #1 spot on our list with the Waste King L-3200. Priced at just around $100 on Amazon, the model is the 6th best-selling product in its category, complete with an average customer rating of 4.4 stars. The L-3200 has all the design benefits you could want from a top-rated disposer. It has compact dimensions (7.8 x 7.8 x 13.8 inches) and weighs less than 9 pounds. Consequently, you can fit the disposal even in the tightest spaces under sinks. The pre-installed power cord is a major bonus, as well as the anti-corrosion polymer grind chamber and stainless steel sink drain flange and internal grind. Some customers only seem to be upset with the small size of the drain opening. For the price, the L-3200 provides outstanding performance. Consumers attest to the fact that the model doesn’t clog, even after prolonged use. The ¾ HP motor spins at 2700 RPM, effectively grinding even tricky food. There may be mixed feelings among users regarding the noise level of the L-3200, but it’s clear that the unit is quieter than a number of competing models. All in all, the L-3200 is approved by happy customers across the country for its performance. 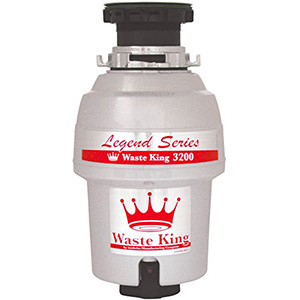 The Waste King L-3200 is undoubtedly one of the best food waste disposer units you can rely on without overspending. You get all the perks that you would with a pricier model, even with additional benefits like an 8-year in-home warranty, low profile design, pre-installed power cord, and more. In summary, the best food waste disposer is directly connected to your home requirements. Make sure that you know the dimensions and mounting system you need prior to ordering your model. When buying your first garbage disposal or renewing an outdated model, you should also brush up on your operation and maintenance know-how to ensure long product life. As long as you don’t abuse your unit with the wrong type of waste, you should enjoy your food waste disposal for years to come. We are moving in a few months and the food waste disposer that we chose to be installed into our new home is the InSinkErator Badger 1. It is affordable and has some good reviews, but I am concerned about the possible corrosion and leakage. 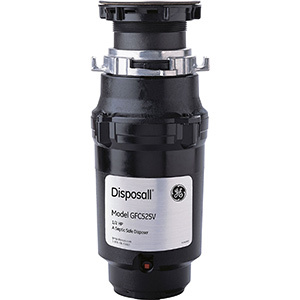 If anyone who reads this has this disposer, can you tell me more about your experiences with it? The Badger 1 is a great model if you’re on a budget. If you have any concerns about potential problems, you can also look into the Waste King L-2600 or InSinkErator Badger 5 that are around the same price range. Also, if you ever have to deal with leakage, we’ve created a quick guide for fixing a leaky disposal on your own here. The GE GFC525V is just OK. It does its job and grinds well, but it is very loud and can be prone to rust which is what I have found. What worries me is that it is said that some people have stated it does not last long, and I just got mine months ago. So how long will it likely last? Thanks for sharing your opinion. For at least one year, the warranty completely covers your model. Check it out for more details about replacing the whole disposal or parts of it. We believe and hope that you will not have any issues with the GE GFC525V. I’m one of those people that doesn’t mind the noise when my food waste disposer doesn’t its thing. That’s why I went with the GE GFC52V. I knew it wasn’t silent but I didn’t care. It has a cord included (many others don’t) and it has enough power to destroy anything it touches (within reason). It’s not even that expensive if you ask me and it will last a lot. I don’t know about the rusting thing because I’ve never had any issues with that. Thanks for the feedback. We’re glad you loved our picks. The Waste King brand of food waste disposers is not the best one to have if you are planning to stay in your home for a while. It is cheap and easy to install, and if you only plan on living in your home for a few years, then it is fine. Otherwise, be prepared to replace it then. Thanks a lot for sharing your opinion. What other product would you recommend for longer use? KitchenAid garbage disposal units I know are sold around here often, and it makes me wonder why other makes are frequently ignored. Truthfully, I think KitchenAid’s products are cheaply made so it does not surprise me that there are leakages with it. Thanks a lot for your feedback. What other brand would you recommend? A neighbor had recommended the InSinkErator Badger 1 garbage disposal because she raved about how easy it was to install. That is great and all but the truth is, this garbage disposal is not worth it because it did not even last a year.